There is no longer any doubt that, for the foreseeable future, public access to computer software and information is essential for the economic development of every country on earth, rich and poor. Yet it is precisely here, in this most forward-looking of technologies, that the ancient legal battle lines of private ownership versus public interest are being drawn again, with extreme intransigence, in the field of international law pertaining to intellectual property rights. In a situation bristling with ironies, it is particularly disturbing that the rampant software piracy in developing nations undermines local development of this crucial economic sector, halting growth and actually reinforcing the global dominance of a few U.S. companies. 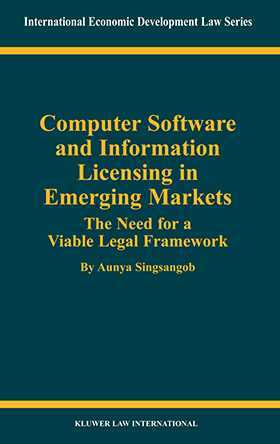 It is urgently necessary to create a legal framework that not only protects licensors and makes piracy unattractive, but also fosters the growth of software and information industries in every country – and particularly in those emerging countries most desperate for economic recovery. In this signally important book Dr. Singsangob presents the case for such a framework with rigour and intensity. His clear-sighted analysis brings into relief, time and time again, many relevant factors, including the following: the ongoing business strategy whereby owners of software and information impose licensing agreements drawn up to their own advantage while merely paying lip service to meaningful reform of copyright law; the vicious cycle that sets in when a country cannot control the internal distribution of software and information, leading to a general lack of confidence in that country's standards and quality and the consequent withdrawal of investment; and the need for a gradual transition from the contract-based licensing approach (albeit on a more equitable basis) to a specific law such as the model law in preparation by UNCITRAL. Dr. Singsangob's study is enhanced by in-depth comparative analysis of numerous provisions in applicable laws of the United States, Thailand, and the European Union, as well as international conventions and the U.S. Uniform Computer Information Transaction Act (UCITA). Although he clearly exposes the conflicts and incompatibilities that underlie the complexity of this area of the law, he argues that a viable legal regime is not far to seek, although time must be allowed for the current bias in favour of licensors to be corrected. He asserts that some such fundamental legal change must occur if we are to have a democratic future. This is a book that promises to bear fruit in the thinking and policymaking of professionals in a number of fields, including economic development, contract law, technology development, and communications law.